To restore health and harmony, the Navajo people create delicate, colorful images from finely crushed stone. 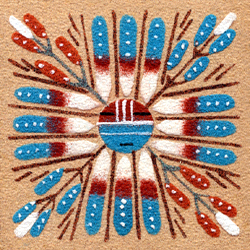 These beautiful, sacred works are Navajo sandpaintings. The Navajo Nation, [Naabeehó Dine'é in the Navajo language] is a self-governing Native American tribe of the United States. The Navajo Reservation, also known as Navajoland [Diné Bikéyah], is located in the northeastern portion of Arizona and extends into both New Mexico and Utah. It covers an area of 27,000 square miles, making it larger than ten of the fifty states. Positioned on the Colorado Plateau, the Navajo Nation includes such famous and spectacular geological landmarks as Canyon de Chelly, Rainbow Bridge National Monument and Shiprock Peak. This is a colorful region of the country. Intensely red shale is sculptured into towering buttes against a turquoise sky and white limestone cliffs are decorated with deeply green juniper trees in Navajoland. The majestic beauty of this distinctive place continues to inspire the people who have lived here for countless generations. The Navajos call themselves the Diné (pronounced “Din-Eh”) meaning “The People.” The name Navajo (also spelled “Navaho”) was derived from the Spanish phrase “Apaches de Navaju” meaning “the people farming the canyons to the west" centuries ago. The Navajos descended from people who crossed the Bering Strait from Asia to North America some 10,000 years ago. They have lived in the Southwest for the last one thousand years. The hogan [hooghan], is the sacred, traditional Navajo dwelling. There are two types of structures: the “male” hogan for meeting with one’s enemy and confronting illness, and the larger “female” hogan where the family lives and meals are prepared. Both styles are constructed of logs held in place by soil, with Mother Earth for a floor and the entrance facing east. Although few hogans are used as homes today, spiritual ceremonies are still conducted there. The Navajos believe that all things- people, animals, plants, mountains and the Earth- are related. Each has its own spirit, giving it both life and purpose. To maintain balance with the universe, the Navajo must perform revered practices in scared locations. 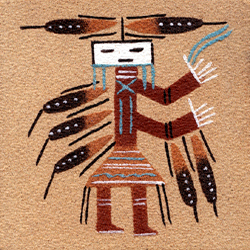 The Navajos probably learned the basic art of sandpainting from the Pueblo Indians when they came to the Southwest. The Navajos applied their own creativity and spiritual significance to the art form. Early Navajo images can be found painted on, or cut into, rock. This indicates that sand was not the first medium used for illustrating the figures later found in sandpaintings. By the 1600’s, invading Spanish and Anglo colonialists discouraged Native Americans from practicing their traditional religious ceremonies. The transition from rock to sand art occurred as the Navajos began performing such sacred practices in secret. While rock pictographs were permanent, sandpaintings were easily destroyed at the end of a ceremony. The secrecy surrounding Navajo sand art began to ease after Washington Matthews, an army doctor stationed in New Mexico, sketched the sandpaintings he viewed in a ceremonial hogan in 1884. The Museum of Navajo Ceremonial Art (renamed The Wheelwright Museum of the American Indian) was founded in Santa Fe, New Mexico in 1935 to preserve Navajo traditions such as this unique art form. Traditional sandpainting designs, containing deliberate errors to make them unreligious, are glued to boards and sold commercially to collectors today. 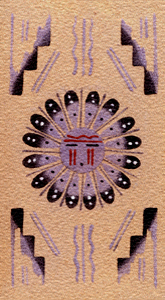 The Navajo sandpainting is a sacred tool that is included as part of a healing ceremony. For this reason, one Navajo term for this art [ikaah], translates into “where the gods comes and go.” According to the Navajos, the universe is delicately balanced between forces of good and evil. When this harmony is disturbed, a misfortune such as illness will result. Only the actions of humans, the Earth People, can cause such an imbalance. For example, kicking over an anthill without offering a prayer of respect will upset the state of harmony [hózhó]. Each act of wrongdoing will determine the type of illness. Balance can only be achieved with the assistance of the Holy People [diyin diné], spiritual beings having fantastic powers. The hand trembler [ndilniihii] analyzes the movements of the patient’s hand during a diagnostic ritual to determine the illness and prescribe the specific chant “way” needed for a cure. For example, building a fire with wood struck by lightning can cause a partial paralysis that requires the Shooting Way (for healing infection from lightning as well as colds, fevers and abdominal pain). 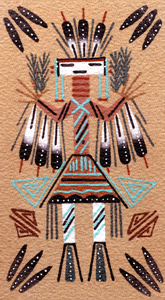 The Medicine Man [hataałii] creates the sandpainting, sings songs and performs chants for as many as nine days during a healing ceremony to pray for a cure. The Navajo believe that if a prayer is offered with perfection, the Holy People are obligated to answer it. 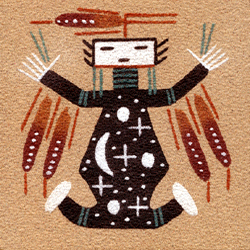 There are approximately 500 different Navajo sandpainting designs. 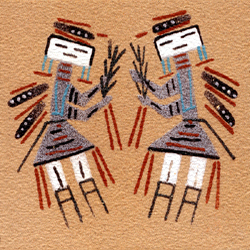 The story that needs to be told by the sandpainting for a specific healing ceremony determines which characters are painted. Sandpaintings depict the Holy People in order to invoke, or call upon, them to help the Earth People. Father Sky and Mother Earth, for example, appear in the sandpaintings of many healing ceremonies including the Shooting Way. Across the black body of Father Sky (shown to the left) are the stars of the Milky Way galaxy, the moon and sun. The figure of Mother Earth characteristically contains the four sacred plants- corn, squash, bean and tobacco. Other Holy People represented include the Changing Woman, the Twin War Gods, Holy Man and Holy Woman. Sandpaintings will also portray a yei [yé’ii], a supernatural being or mythical hero of the story, in either male or female form. Yeis are caring and inclined to help the Navajo. Wind, Thunder, Moon, and Earth are painted in human form to demonstrate their connection to the Earth People. A protective garland to ward off evil frequently borders three sides of the sandpainting. This guardian may consist of a rainbow, interlocking arrowheads, or sunflowers. Its eastern edge remains open so the Holy People may enter and empower the image. Red, another sacred color, represents sunlight. The paintings are made primarily from naturally colored sand made by crushing of rocks from within the traditional boundaries of Navajoland. They include gypsum (white), ochre (yellow), sandstone (red), charcoal obtained from burnt scrub oak (black) and a blend of pulverized charcoal and gypsum (blue). Pebbles of other colors are not used in sandpaintings. Crushed, dried plants including corn meal, powered bark, pollen or flower petals are added to the mix to achieve a fuller range of colors. Sandpaintings are more accurately called dry paintings because of the natural materials from which they are produced. To paint, a pinch of sand is placed in the palm of the hand and then trickled off the bent index finger while guided by the thumb. The sandpaintings are usually created on the bare floor of a hogan, although on occasion they are prepared upon a cloth tarp or buckskin. 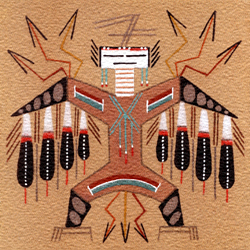 The Navajo have fifty healing and blessing ceremonies given by the Creation Story. A ceremonial can last up to nine days depending on the diagnosed illness and is conducted by the Medicine Man. The Night Way is a curative ceremony to restore harmony. This nine day ceremonial is performed during the cold months when there is no chance of being struck by lightning nor bothered by snakes. The Blessing Way blesses a newly constructed hogan, a marriage or a newborn child. One or more songs from The Blessing Way are included in nearly every ceremony. The sandpainting is the final part of the ceremonial, following chants, dances, prayers, songs and lectures. The entire sandpainting ritual must be completed in a single day, usually during daylight hours. Ceremonial sandpaintings usually measure between 6 and 8 feet, although they can be much smaller or as large as 20 feet. If the required sandpainting is too large for the Medicine Man to make in the permitted time, others may assist with his supervision. The inflicted person sits in the center of the sandpainting, facing east, the direction from which the Holy People will enter with their healing powers. The patient is then sung to. 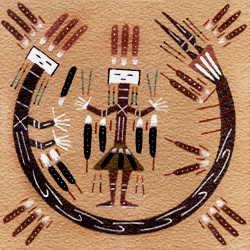 The Medicine Man touches the sandpainting with wet fingers and transfers sand to the body of the person being healed. After the ceremony, the sandpainting is erased with a sacred feather and removed from the hogan. A showcase of Navajo sandpaintings accompany this feature.